The fluorescein clearance test (FCT) provides insight into the tear film dynamics. The purpose of this study was to describe an inexpensive and practical method for assessing FCT in dogs, using photography and software analysis, and to assess the retention time of 1 vs. 2 eye drops on the canine ocular surface. (i) In vivo - Eight healthy German Shepherd dogs were recruited. Following topical anesthesia with 0.5% proxymetacaine, each eye sequentially received (1 week apart) either 1 drop (35 μL) or 2 drops (70 μL) of 0.5% fluorescein. A Schirmer strip was inserted in the ventral conjunctival fornix for 10 s at the following times: each 10 min for 100 min, 24 h, 48 h and 72 h. (ii) In vitro - Schirmer strips were placed for 10 s in contact with microplate wells containing 1 or 2 drops of 0.5% fluorescein. In both experiments, the fluorescein-impregnated Schirmer strips were immediately imaged, and the area and intensity of fluorescein uptake were analyzed with ImageJ software. For the in vitro experiment, images were evaluated by the same examiner (repeatability) or two examiners (reproducibility). Photography-based FCT was easy to perform and showed high repeatability and reproducibility (coefficients of variation ≤2.75%). In vivo, the area and intensity of fluorescein uptake on Schirmer strips were significantly greater at 30 min and 40 min post- fluorescein instillation in the 2 drops vs. 1 drop groups (p ≤ 0.044). Compared to baseline, the residual fluorescein uptake on Schirmer strips was < 5% at 60 min and 90 min in the 1 drop and 2 drops groups, respectively. Photography-based FCT is a practical and reliable diagnostic tool with various clinical and research applications in veterinary medicine. Instillation of two drops provided greater amount and longer retention on the anesthetized canine ocular surface than a single drop. Fluorescein clearance time of a single drop in dolichocephalic dogs is 60 min. The ocular surface is covered by a thin layer of tear film, mostly responsible for lubrication, nutrition, and protection against microbial and toxic agents . Tears are secreted by the lacrimal glands, spread onto the corneo-conjunctival surface, then either evaporate, absorb into tissues of the ocular surface, or drain through the nasolacrimal duct. Together, these physiological aspects (secretion, distribution, turnover and elimination) are termed ‘tear film dynamics’ and are critical for the health and function of the eye . Tear film dynamics can be assessed by various modalities including interferometry, lacrimal scintigraphy and fluorescein clearance test (FCT) . FCT relies on measuring the decay of fluorescein in the tear film over a period of time. It is often performed with a commercial fluorophotometer device that can quantify fluorescein concentrations in a sensitive manner . However, the fluorophotometry technique requires costly equipment and is not practical for routine clinic use. Thus, a simpler clinical test has been developed . It involves photography of Schirmer strips to monitor dye disappearance, and has been reported to have excellent correlation with the fluorometric assessment of tear clearance in humans . The main purpose of the study was to describe the Schirmer-based FCT in healthy dogs. Further, we aimed to determine the retention time of one vs. two drops on the canine ocular surface, thus describing a practical application of the FCT in veterinary species. Eight healthy intact German shepherd dogs (6 males and 2 females), aged 3 to 5 years (3.9 ± 0.83 years) were recruited from the Military Police of Bahia, Brazil. All dogs were confirmed to be ophthalmoscopically healthy with patent nasolacrimal ducts by slit lamp examination, indirect funduscopy, rebound tonometry, Schirmer tear test, fluorescein staining of the ocular surface, and Jones test (fluorescein passage test). A test solution of 0.5% fluorescein was made by 1:1 dilution between 1% fluorescein solution1 and 0.5% carboxymethylcellulose sodium lubricating solution.2 Based on findings of a preliminary study using an automatic pipette3 to measure the drop size of 5 ophthalmic solutions commonly used in Brazil, the volume of a drop was set to 35 μL for the experiments described below (data were not shown). The study was conducted in the morning hours, with a temperature of 27.9–38.0 °C and an ambient humidity of 38–55%. Schirmer tear test I (STT-I) was performed in each eye by inserting a standard Schirmer strip4 in the lower lateral conjunctival fornix for 1 min. Ten minutes later, a drop of 0.5% proxymetacaine hydrochlorid5 was instilled in each eye, and after removing the excess solution with a sterile swab, Schirmer tear test II (STT-II) was performed and recorded in mm/min. Ten minutes later, an automatic pipette was used to instill 35 μL (1 drop) of 0.5% fluorescein in the left eye and 70 μL (2 drops) in the right eye. The excess of fluorescein solution was gently removed from the conjunctival sac with a sterile swab. At t = 10 min and every 10 min thereafter for 100 min, as well as 24 h, 48 h and 72 h, a Schirmer strip was inserted into the lateral lower conjunctival fornix of each eye for 10 s. Immediately after removal from the conjunctival fornix, the Schirmer strips were placed in a box and a Nikon camera6 with a yellow filter7 placed 23 cm above the strips was used to picture the tear fluorescence in a blue light8 (Fig. 1). The protocol was repeated in each animal after 1 week of washout period, instilling 35 μL (1 drop) of 0.5% fluorescein in the right eye and 70 μL (2 drops) in the left eye (crossover study design). The 0.5% fluorescein solution was transferred to a 96-well microplate,9 15 wells containing 35 μL (1 drop) and 15 wells containing 70 μL (2 drops). Schirmer strips were placed in contact with the wells for 10 s, then immediately transferred to the box and photographed as described in the in vivo experiment. All pictures were analyzed with the ImageJ Program10 , recording the following two measure outcomes in each Schirmer strip (Fig. 2): area of fluorescein uptake (mm2) and fluorescein intensity (arbitrary units; AU). The areas of fluorescein uptake were automatically delineated by the software although slight manual adjustments were needed on selected cases. For the in vitro study, the same image was analyzed twice by the same examiner (intra-examiner variability, i.e. repeatability) or by two different examiners (inter-examiner variability, i.e. reproducibility), evaluating the area of fluorescein uptake and fluorescein intensity as described above. The coefficient of variation (CV, expressed in %) was calculated for assessing test repeatability and reproducibility. Normality of the data was assessed with the Shapiro-Wilk test. The Wilcoxon signed-ranked test was used to compare STT-I and STT-II values in the same eye and to compare the right and left eyes for STT values, area of fluorescein uptake and fluorescein intensity. Differences in fluorescein areas and fluorescein intensities between one drop and two drops groups were examined with the Friedman test followed by Dunn’s pairwise comparisons. The same test was used to compare the residual fluorescein areas and intensities between both groups, calculated at each time as a percentage compared to the initial data collected (i.e. 10 min post fluorescein instillation). Statistical analysis was performed using GraphPad Prism,11 and values p < 0.05 were considered statistically significant. Data was not normally distributed for any test (P < 0.05), so all results are presented as median ± semi-interquartile range. Results of STT-I testing (30 ± 3.6 mm/min) were significantly greater (p = 0.004) than STT-II values (28.2 ± 3.8 mm/min). The FCT was well tolerated in all dogs. An example of fluorescein strip analyzed by ImageJ is depicted in Fig. 3, in which the fluorescein area was 155 mm2 and the fluorescein intensity was 1828 AU. The area and intensity of 0.5% fluorescein impregnated onto the Schirmer strips decreased over time (Figs. 4 and 5). 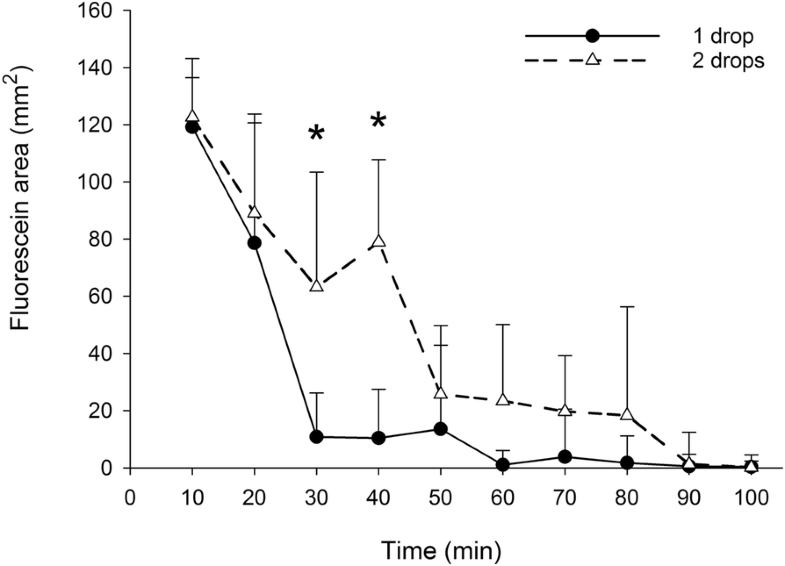 At 30 min, eyes that were administered two drops vs. one drop of 0.5% fluorescein solution yielded Schirmer strips that had significantly greater fluorescein areas (63.1 ± 40.3 and 10.8 ± 15.4 mm2, respectively; P = 0.025) and fluorescein intensities (4916.6 ± 2418.6 and 796.0 ± 1163.1 AU, respectively; P = 0.044). The same finding was noted at 40 min for both fluorescein areas (79.0 ± 28.8 and 10.4 ± 17.1 mm2, respectively; P = 0.039) and fluorescein intensities (6766.9 ± 2324.0 and 798.7 ± 1183.2 AU, respectively; P = 0.002). Although the fluorescein areas and intensities were overall greater in the 2 drops group compared to the 1 drop group during other timepoints, differences were not statistically significant (p ≥ 0.078). Table 1 describes the residual fluorescein areas and intensities at each time point (times 20–100 min) for each group, calculated as a percent relative area or intensity compared to the first data collected (time = 10 min). Despite noticeable differences in the median values between both groups, no statistical significances were noted at any time point for either fluorescein area (P = 1.000) or fluorescein intensity (p > 0.441). Twenty-four hours after dye instillation, fluorescein was still noticeable on Schirmer strips in 1/16 eyes (6.25%) of the 1 drop group and 6/16 eyes (37.5%) of the 2 drops group. At 48 h, fluorescein was present in 1/16 eyes (6.25%) and 2/16 eyes (12.5%) of the 1 drop and 2 drops groups, respectively. At 72 h, none of the Schirmer strips had fluorescein uptake, indicating that 3-day washout period is a minimum for FCT in dogs. The coefficients of variation of intra-examiner and inter-examiner assessments were very low (≤ 2.75%), as summarized in Table 2, indicating excellent test repeatability and reproducibility. The present study describes a practical and cost-effective method to evaluate FCT in dogs. This test provides insight into the tear film dynamics and can be a valuable addition in diagnosis and management of ocular surface disease in veterinary species. In human patients, FCT has been shown to have a greater predictive value for ocular irritation than Schirmer tear testing and it correlates better with decreased corneo-conjunctival sensation and meibomian gland dysfunction [5, 6]. The technique used herein is a modification of previous reports in humans [3, 6, 7]. First, the duration of Schirmer strip insertion at each time point was set to 10 s, in contrast to 1 min [7, 8] or 5 min  in human subjects. Since standard Schirmer tear testing is performed over 5 min vs. 1 min in humans and dogs, respectively [9, 10] the duration of FCT was adjusted accordingly to avoid depleting the majority of the fluorescein dye from the canine ocular surface at the first time points. Second, our method employed standardized imaging technique in which a camera with yellow filter was set to a fixed distance from the Schirmer strips and a blue light was used to excite the fluorescein dye. The images were then analyzed objectively using the ImageJ software, thus representing an advantage over previous reports in which the fading of fluorescein dye was assessed subjectively with the naked eye , comparing the intensity of staining to a standard Schirmer color plate . The main advantage of the present FCT over fluorophotometric evaluation  is the use of equipment readily available to most investigators. However, it may not be as sensitive as fluorophotometry to detect low concentrations of fluorescein, and one should only use the same type of Schirmer strips  of the same lot number  to reduce the variability in strip absorption of fluid. 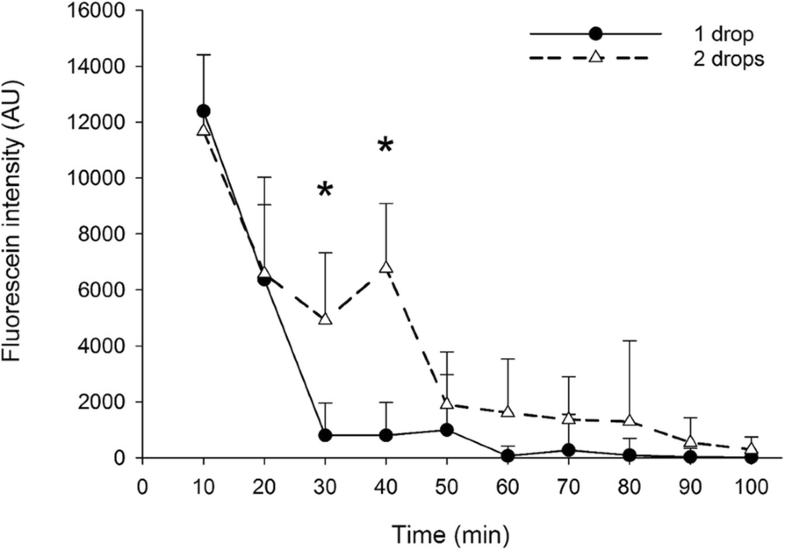 The amount of fluorescein retained on the canine ocular surface was greater when 2 drops (70 μL) rather than 1 drop (35 μL) were instilled at baseline, with a statistically greater fluorescein area and intensity noted at 30 min and 40 min. The human palpebral fissure is capable of holding only 25–30 μL of fluid  so any excess would rapidly escape through the nasolacrimal duct or spill over the lower eyelid. However, this information is lacking in dogs, and it is possible that the palpebral fissure of a large German Shepherd dog can accommodate larger volumes of fluid. In beagle dogs, Gelatt and colleagues  noted that only 0.139% of fluorescein was retained on the ocular surface after 45 min of dye instillation, an amount much lower than the 8.7% noted in the present study. Differences in methodology notwithstanding, this variation between species warrant further investigation and may be partly explained by differences in nasolacrimal duct transit among brachycephalic, mesaticephalic and dolichocephalic dogs . The homogenous population selected (all German Shepherd breed) represent a limitation of the study, as well as the relatively low number of subjects examined, although the cross-over study design improved the experiment’s statistical power. The use of topical anesthetic in FCT may also represent a limitation of the protocol, as it has been shown to suppress the rate of tear turnover in rabbits and thereby increase the pre-corneal residence time of ophthalmic solutions . Thus, the differences noted between one vs. two drops should be interpreted with caution as these findings may differ in the non-anesthetized eye. Similar to human reports, topical anesthetic was used herein to reduce reflex tearing and thereby improve the reliability of Schirmer testing, and because tear clearance rates in anesthetized eyes are supposedly the same as basal tear turnover in non-anesthetized eyes . However, the impact of topical anesthetic on Schirmer testing is not straightforward, with some authors reporting a greater variability of Schirmer values in anesthetized vs. non-anesthetized eyes . FCT represents a diagnostic tool with clinical and research potential in veterinary medicine. Clinically, FCT could be used to assess the clearance of tear film in patients with suspected aqueous tear deficiency or nasolacrimal duct obstruction. Based on our findings, clearance would be defined as normal (in dolichocephalic dogs) if a single drop of 0.5% fluorescein could not be detected (< 5% area and intensity) at the 60 min time point. Of note, this duration is longer than the 20 min timeline reported in human subjects . In a research setting, FCT could have multiple applications such as determination of tear turnover rate in various breeds and investigation of the retention time of drugs that have different properties (e.g. viscosity, pH, etc.). The original version of this article has been revised. Figure Legends for Figs 2 and 3 have been swapped around after having been mistakenly interchanged. A correction to this article is available online at https://doi.org/10.1186/s12917-018-1632-8. The authors thank the Military Police of Bahia for providing the dogs used in this study. APO and LS designed the experimental study and critically revised the manuscript. MFR and APO execution of the study. APO, ACR and MFR contributed to the analyses of the overall experimental data used in this study. APO, MFR and LS participated in discussion. EMF and LS performed statistical analyses. FADN was responsible for the design and use of the equipment to capture the images. All authors contributed to drafting the manuscript and gave final approval of the version to be published. The study was approved by the Ethics Committee of the School of Veterinary Medicine and Zootechny of the Federal University of Bahia (protocol number 72/2016) and adhered to the Association for Research in Vision and Ophthalmology (ARVO) statement for the Use of Animals in Ophthalmic and Vision Research. Labno C. Basic Intensity Quantification with ImageJ. In. University of Chicago. http://rsbweb.nih.gov/ij/docs/examples/index.html -- Accessed 18 July 2018. Savini G, Prabhawasat P, Kojima T, Grueterich M, Espana E, Goto E. The challenge of dry eye diagnosis. Clin Ophthalmol. 2008; https://doi.org/10.2147/OPTH.S1496.